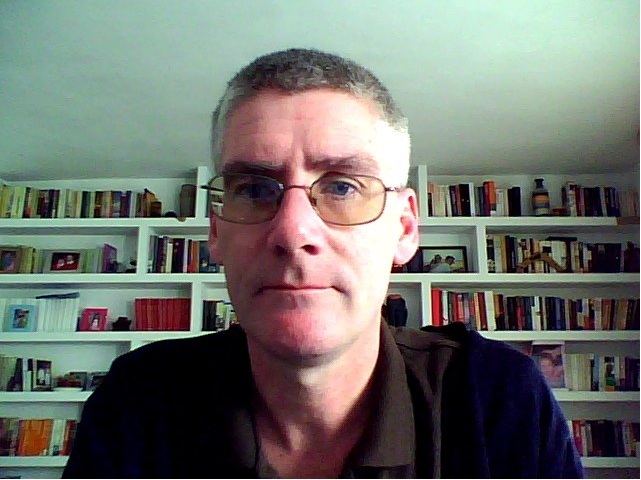 My full name is Enda Francis Scott Byrne, born in Ireland and now a Spanish Citizen. I have been working in Education for over twenty five years and have held numerous teaching, training and managerial posts. I am a past President of TESOL-SPAIN and am currently getting involved in translation and maintain the blog eflbytes.wordpress.com . Up to now, building my career in education and adopting our two Colombian children has kept my writing on a back burner. At the moment, however, I have the time and enthusiasm to rewrite, improve and publish. This page and its links provide more information on what I am working on. Wavering Goodbyes is a contemporary, literary novel, dealing with friendships, loyalties and how they sift and warp under the pressure of harsh economic times. Nemed has returned to the violent world of the island. He has regained his grandmother and old friends but a girlfriend and other charms of the city still haunt. Emotional ties start to unravel as his trips to the cliffs breathe the temptation of a new love, another world. - 50,000 words approx. Completely revised 2012. Thatcher has won the election but Janet has run away. The bleak coasts of western Ireland appear to offer shelter. She drinks her nights away down the pub, with London, Ray, her past, safely distanced. Through the clouds of her hangovers, however, an intruder appears and spectre or mental illusion he drags her through new experiences. Shook by his sudden loss Ray starts his search for his ex-girlfriend. With Ray chasing behind, Janet is forced to delve back into, not just her immediate past, but the darkness that was her childhood until the final secret is broken and she may finally rest in peace. Only a genaration later, when Ray and the baby girl Janet used to care for, finally turn up on an Irish doorstep do the secrets cease hatching. - 73,000 words approx. Completely revised 2013. From the bleakness of a coal cellar and its aimless hostage, the story of a town�s recent history develops. A collision of characters and history combine in a growing examination of the futility but also the frightening simplicity of one town�s spiralling strife and ultimately destruction. From the darkness, the pain of mutilated hands, Dovric�s mind spins through the turmoil of events searching for an innocent party, wondering vaguely how he, who had never had an opinion in his life, had become the last remaining hostage with nothing left but the dark. They chopped his fingers off, one by one, as pointlessly cruel as the civil war raging overhead. Moving from farce to bloody realism a series of murders in Southern Spain brings Sean out of academic repose in Dublin and re-unites him with his old comrade at arms, the South American photographer Domingo. The link is vampirism. The bodies are headless with a stake through the heart. Sean once wrote about the vampire myth but bloody corpses are not quite the same. Domingo is there because Sean no longer has the guts to go alone, or is it just nostalgia for an old flame? The deaths roll on, come closer. Captain Perez has little time for the intruders. But it is Sean who realises that the stake in the heart doesn�t kill, rather it creates vampires. A stake in time ... could easily create nine. Northern Spain. A train ride threatens to end in murder: he pulls back from his victim just in time. She doesn�t realise, catches his glance and thinks he�s cute. Her father would never agree ... but that was another story. What develops is a tangle of romance, unreliable parents against a background of South American dictatorships, the �missing� and their children. His mother's experiences in prision had driven her crazy. Her father's secret life has left her untrusting. As their relationship unfolds they realise it isn't their story but the lives of their parents that are coming together one more time, in a final, bloody, struggle for reconcilation or simply revenge. An English journalist arrives in a small Irish town in search of an eighty year old who he believes is still running arms. Unfortunately, the old man is killed in a hit and run. Accident? Cover up? As the investigations unravel even the journalist finds it difficult to separate story from legend, myth from personal desires. He was killed just in time, so that nothing could be clarified, above all, the past.